The future of yucatan spider monkeys looks grim. Only about 2000 are left in the wild on the Peninsula. With their habitat being destroyed at a fast rate, estimates are that over the next three generations their numbers will drop dramatically. 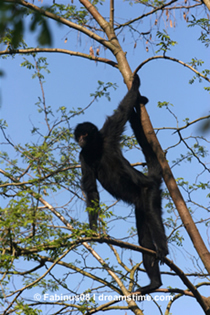 The Yucatan mono araña is considered a sub-species of the black-handed spider monkey or Ateles geoffroyi. They are native to the Yucatan Peninsula, Belize and Guatemala, as opposed to the more common black spider monkey that inhabits the outer banks of the Amazon and the mountain terrains of the Andes. You could say these acrobatic animals are the jungle equivalent of Spiderman. Like a spider, they cling to the trees with their extremely long arms and legs. Hence their name. A long, slender body and black hair enhance even more their spidery looks. Some individuals are tan-colored or have a tan coloring around their eyes and chin. Their hair is course and often looks matted. As you can see on the picture below, they have whiskers around the head. Are you taking my food? Like humans, gorillas and chimpanzees have something called "opposable thumbs". This means the thumb can be moved to touch the other fingers, a physical adaptation that comes in handy if you want to grab something or eat with one hand. Think about that for a moment. Look at your hand and try to imagine what it would be like not being able to move your thumb against your fingers. Thank God for evolution! Unlike their old world cousins though, spider monkeys are stuck with these non-opposable thumbs. Their hands are curved and have the appearance of a hook. To compensate this lack of grasping-utility nature has equipped them with a prehensile tail. The tail is basically an extra arm. Prehensile literally means 'able to grasp' in Latin. You can see them swinging from one tree to another by switching between their hands and tail to grasp the next branch. Aditionally aided by its excellent eyesight a spider monkey can travel a distance up to twelve meters (forty feet) with one swift movement. No wonder they are known as the acrobats of the forest! The monkeys live in groups ranging from 10 to sometimes over 100 individuals. These groups are typically dominated by females. They make their homes in treetops and rarely ever do their feet touch the ground. A wetter climate is preferred as opposed to a dry forest, but you can also find them in elevated regions. Their diet is made up of almost 90 percent fruit. The other 10 percent are insects and eggs. 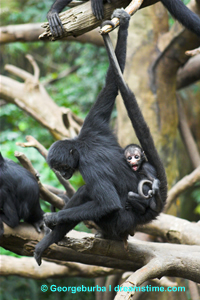 Some animals store their food, but spider monkeys do not. Instead they just eat a lot of food at one time, normally as soon as they pick it off the tree. This is also the reason why they have to travel distances to find their food, need an extensive territory and are more vulnerable than for example howler monkeys to the loss of their habitat. The head female monkey is in charge of planning the foraging route. 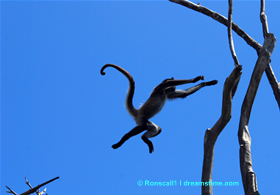 Sometimes as many as 100 spider monkeys can be found in a single tree eating. They do fight over the fruit if it is sparse. Individuals in captivity are fed a combination of fruits, dog food, bread and a few vegetables like carrots and lettuce. A female will produce one baby every few years. At birth, it is all black and will ride on its mother’s back for the first two years of its life. It will not begin eating fruits until it is nearly two years old. Juveniles are very playful and spend the majority of their time jumping and playing with other juveniles and adults by jumping on their backs. 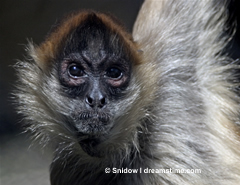 The lifespan of the endangered spider monkey in the wild is about 25 years. In captivity it is closer to 35 years. They have many natural enemies. Any animal that can climb a tree is considered a threat. The loss of their forests is a major cause for their declining population as is the fact they only reproduce one offspring every two to three years.